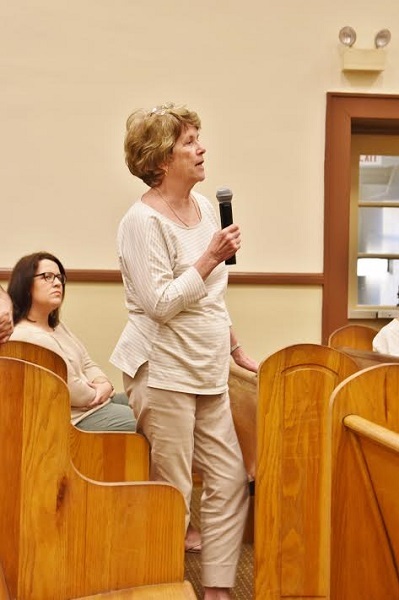 About 30 New Albany voters attended the political speaking event Tuesday night at the courthouse, but those present listened intently as the candidates in the New Albany city election spoke and answered questions. Less than two weeks remain until the June 6 general New Albany city election, which will decide New Albany city officials for the next four years. 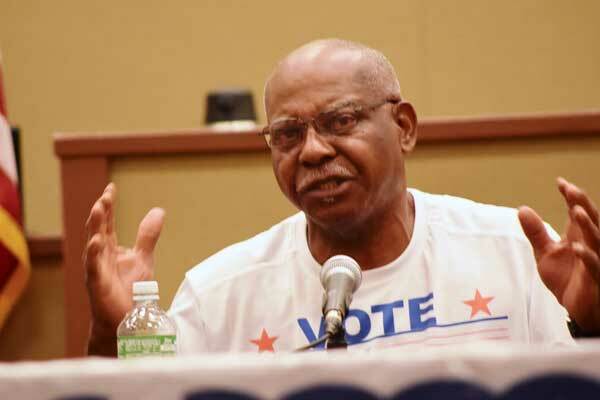 Election to several offices was decided in the May 3rd primary elections when the incumbent police chief and three of four incumbent alderman won their party primaries and face no opponent on June 6th. For the first time in memory both a Democrat and a Republican are contending for the office of New Albany Mayor. 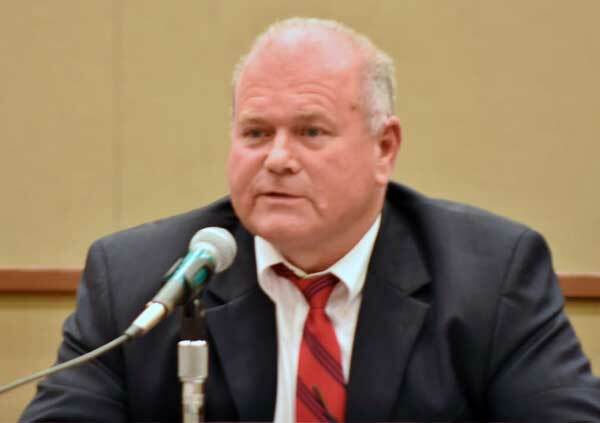 Three-term incumbent Democrat Tim Kent and his Republican challenger Jeff Olson, now serving as Ward One Alderman as a Democrat, both participated in the Tuesday night forum in the circuit courtroom of the Union County Courthouse. The Alderman at Large seat on the city board is an open seat, because incumbent Democrat Scott Dunnam is not seeking re-election to that seat, but is running for Ward One Alderman. Keith Conlee, Republican Alderman at Large candidate. The Democratic candidate for Alderman at Large is military veteran and retired educator Larry Dykes. Dykes was present Tuesday night and spoke for himself. 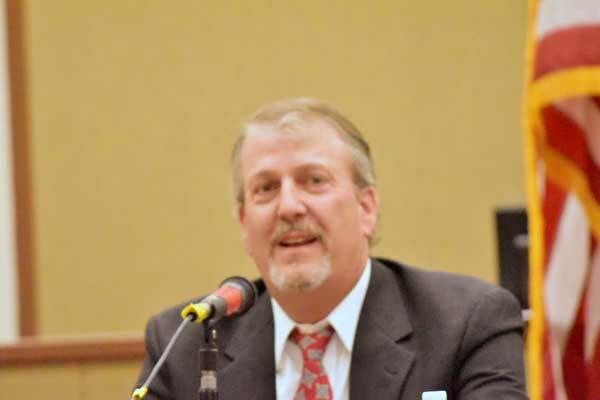 Keith Conlee, the Republican nominee for Alderman at Large, was participating in a long-scheduled national sales conference for his company and was unable to be present Tuesday night. Sue Morrison read a prepared statement on Conlee’s behalf. The Ward One seat on the city board is also open as incumbent Jeff Olson is running for mayor. 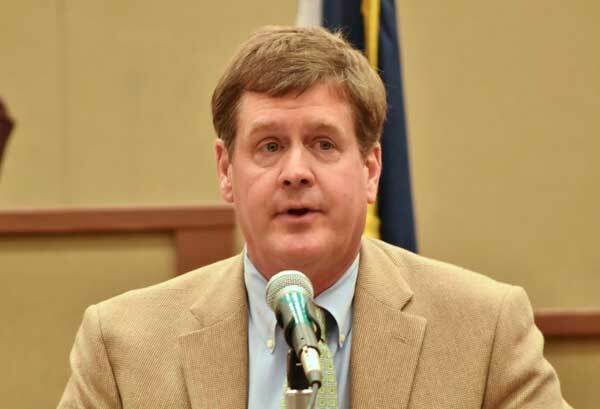 Scott Dunnam, the Democratic candidate, has served as the city’s Alderman at Large for three terms. 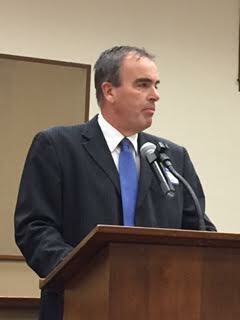 Dunnam chose instead to run for the Ward One post and spoke at the Tuesday evening event. 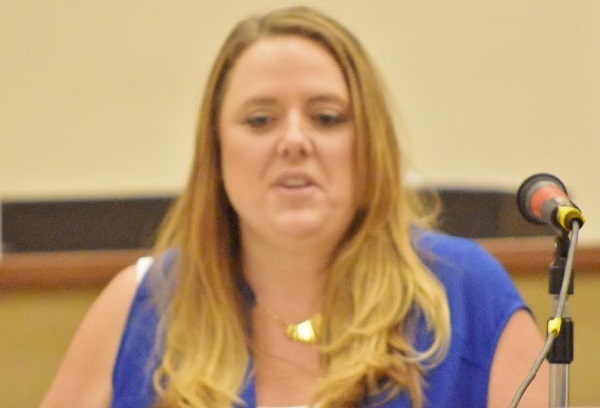 The Republican nominee for Ward One Alderman is educator Amy Livingston. She spoke Tuesday night on behalf of her candidacy, believed to be the first time a Republican has ever sought that seat. —Police officers driving at excessive speeds on downtown streets. —Ways of financing improvements in city streets, the water supply system, and other large projects. The meeting of candidates for the New Albany city election was arranged by Jean Ashcraft of TV99NewAlbany and Sue Morrison, president of the Union County Republican Women’s Club. Terry Cook of WNAU-AM served as moderator for the event. Locally grown produce, meats, dairy, eggs, canned goods, and prepared foods will be featured.